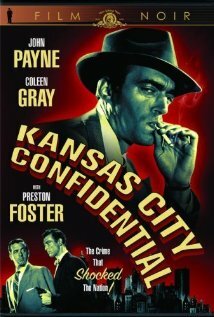 This is pure film noir, with all of the usual shady characters, a sinister plot and even a cheesy love interest, played by Coleen Gray as the daughter of one of the principal characters. Shot, of course, in black and white by director Phil Karlson, this 1952 release was in the last wave of the genre and still stands the test of time. A masked man summons three others, one by one, to his hotel room in order to propose a crime, in which all four will share the proceeds. One catch; no one but the masked man knows who the others are. He then assists them in the hijacking of some money from an armored car, using a vehicle which is identical to that of a local florist, and driven by an ex-con. The police immediately apprehend the driver for the crime, assuming that he is guilty. While he is being beaten, in an attempt to gain his confession, he realizes that he is being framed. Moreover, he believes that he knows who it is. Meanwhile, the alliance between the 4 actual robbers, of whom only one knows all the identities of the rest, is beginning to unravel, as mistrust and greed begin to set in. When one member unwittingly falls for the daughter of another, things heat up even more as the film ticks towards the inevitable conclusion of double cross, and in some sense, justice. A remarkable film made at the tail end of the film noir genre, it still has that gritty quality that makes it the little gem that it is. Well preserved, with a crisp picture and clear audio, this is a surprisingly good film.